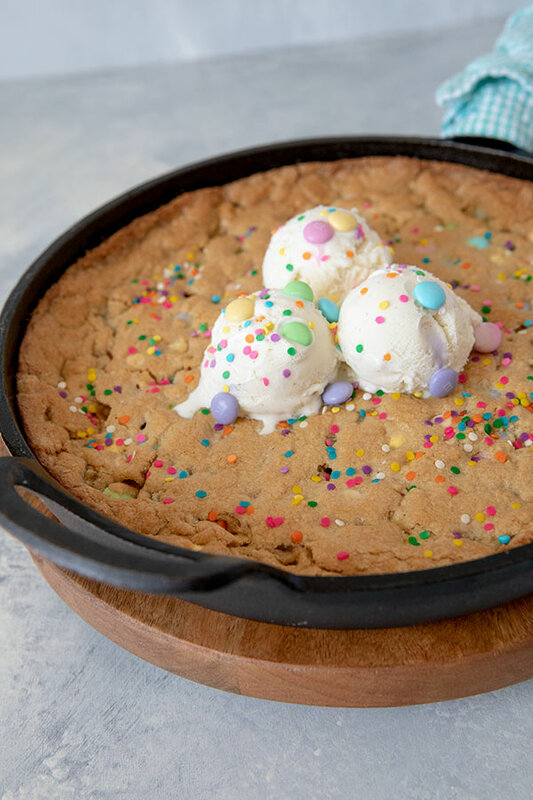 This Easter Skillet Cookie is a big, rich buttery, chocolate chip cookie dressed up for the holidays with Easter M&M’s and confetti sprinkles. My family loves skillet cookies. We like to call them skookies. Cooking them in a buttery cast iron skillet makes the exterior crispy, while keeping the middle tender and chewy. Also included in this post is a Recipe Round Up. I’ve joined a fun group of bloggers to put together a roundup of recipes on the first day of every month. 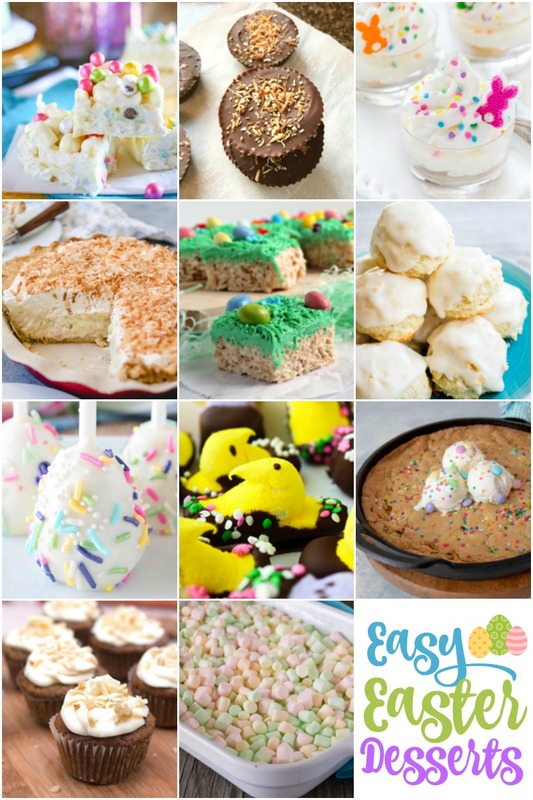 This month we’re sharing Easy Easter Dessert Recipes. I was inspired to create this skookie by the white Easter M&M’s available at Target. I stirred in semi-sweet chocolate chips to the batter, then gently pressed the Easter M&M’s on top of the dough once it’s spread in the pan, so the colorful M&M’s stay on top. Don’t worry about spreading the dough all the way to the edges of the pan, because as the cookie bakes it will expand and curve up the edges more if you press it all the way to the edge of the pan. The first time I made this Easter Skillet Cookie, I made it with White Chocolate M&M’s. This year, I couldn’t find the White Chocolate M&M’s so I used Milk Chocolate M&M’s and White Chocolate Chips. I had some colorful confetti sprinkles in the cupboard, so I finished the top with a sprinkle of confetti. Any combination works. 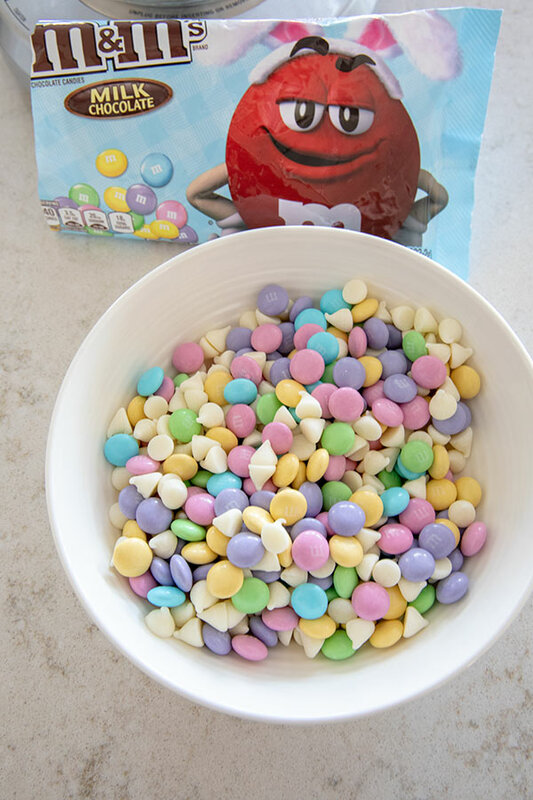 My husband loves the peanut butter M&M’s, they would be great in this recipe as well. Maybe with some Reese’s peanut butter baking chips that you can find in the baking aisle. If you’re serving the skookie with ice cream, add it to the individual slices. I just added it to the center of the cookie for fun pictures for the post. 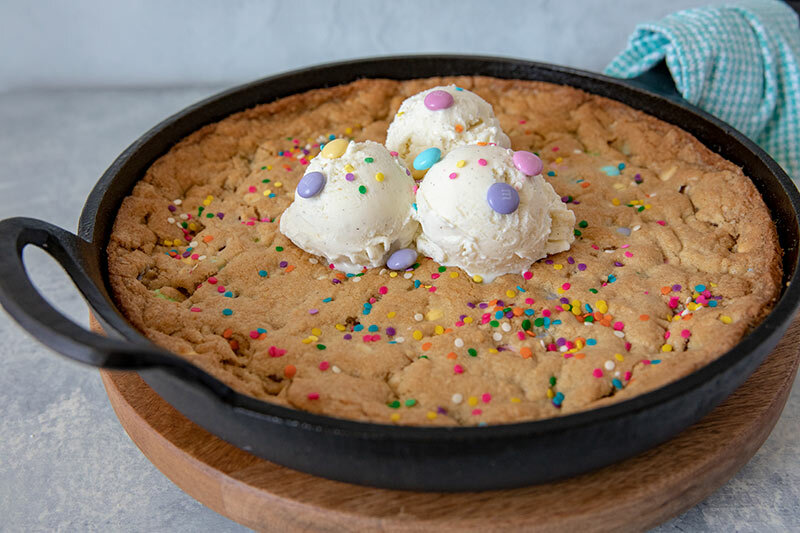 This skillet cookie comes together in a flash, and it’s a perfect way to use up some of the Easter candy the Bunny is going to stash in your Easter baskets this year. Preheat the oven to 350°. Grease the bottom and sides of a 9-inch cast-iron skillet with 2 tablespoons of butter. In the bowl of an electric mixer, beat 1/2 cup butter, sugar, and brown sugar, on medium speed, until well blended. Beat in the egg and vanilla. Add flour mixture; mix on low just until combine. Stir in chocolate chips. Press the cookie dough into the prepared skillet. Sprinkle M&M’s over the top and gently press in to the dough. Sprinkle confetti sprinkles on top. Bake for 20 to 25 minutes, until the edges are crisp and the cookie is golden and cooked through. Remove from oven. If desired, serve warm topped with vanilla ice cream. High altitidue adjustment: Increase oven temperature to 375 degrees, add an additional 2 tablespoons flour, and bake for 15 - 20 minutes. This looks like a fun baking project to do with my kids on the weekend! I’m still yet to make a skillet cookie but god they look good! This looks so irresistible, Barbara! 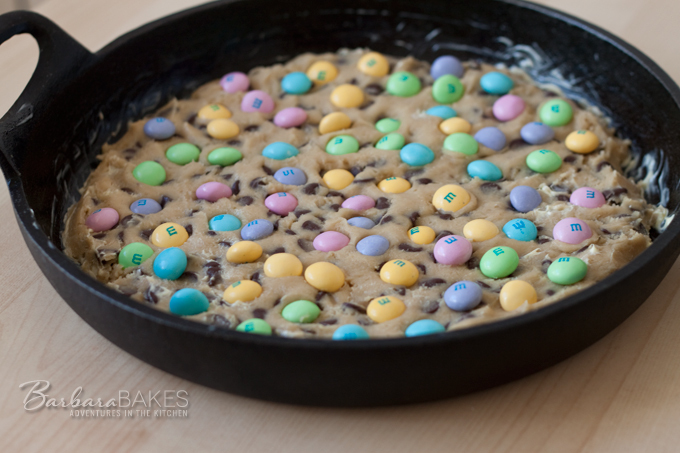 Love those pastel M&Ms and how easy this skillet cookie is. I could devour it all myself! We don’t get Easter M&Ms here. I love those. 🙂 I also love a skookie and we call them that in our family – my kids and I. This one’s a beauty. Oh my I am going to be a very popular person at my work place which is populated by some major cookie monsters. Plus I have been educated. I had no idea there were white M & M’s. I guess I have been living in a closet. Really turned out Easter Bunny cute. Makes me want to do the Bunny Hop. Goodness that sure dates me!!!!!! 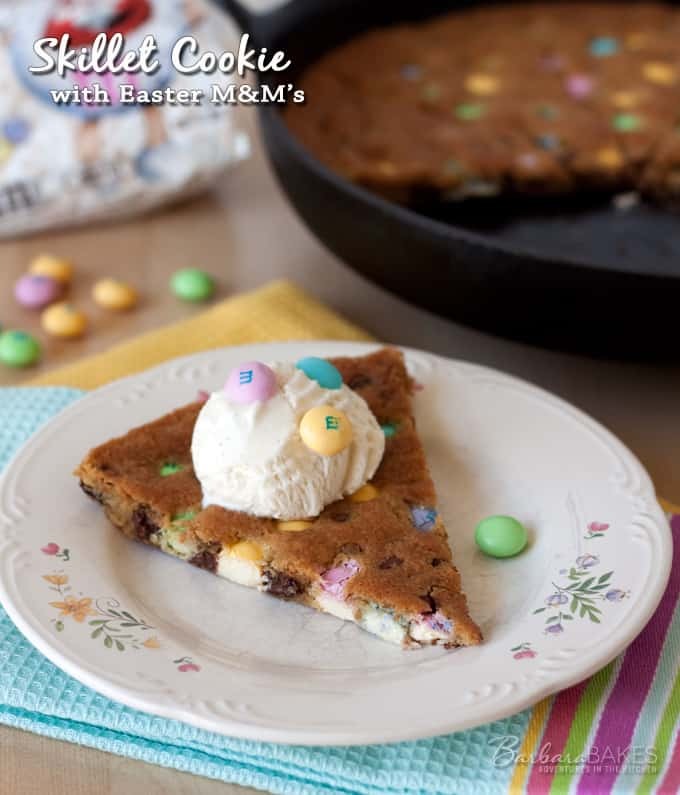 This skillet cookie is so fun for Easter! I love it! Skookie. I like that! Aren’t the seasonal M&M’s a lot of fun. I just posted cookies with their spring colors. I am sure that my skinny son would love a skookie. They do look quick and easy to do! I love baking in my skillet! This Easter cookie looks so so good! Pinning!